Just wanted to say I posted a new Beauty Icon post on Taylor Swift! Check it out! Also, if you have any questions for me regarding beauty or want you want to here from me (and everybody else), you can email me at famineoffashion.sammy@gmail.com! New post on trends. If you like braids such as the Katniss braid, check it out for tutorials and more! You might have noticed that the top of the page has changed a lot. We decided to delete the Fun page because it was too much like Christina’s Column and the Dancing page because we’re really the only ones who care about dance and no one really looks at it. Our home page is now only for announcements, polyvores, and letters from the editor. Any other posts will be going under their proper page. However, this does mean that you won’t be getting emails when we change a page on the blog, so check on it often. Hey people! You guys are probably wondering about the title. . . Its about girls who feel pressured to suddenly “grow up” and become more like teenagers. I feel like girls shouldn’t feel too pressured to grow up because you’re still very young, and there’s no need to rush things! I know that many girls around the ages of 11,12, and 13 like to act more and more like teens. I’m 13, but I still act like a kid sometimes – and thats okay! Just because your thirteen, doesn’t mean that you have to act grown up! You’ve got your whole life ahead of you, so don’t rush it! You can still go outside and blow bubbles, but you can also have a blast getting a makeover at the mall. Sure, there might be girls at your school who might feel the need to grow up because their tweens, but this girl doesn’t have to be you. I think that no matter what age you are, you can still have fun to do what you like! You might be 17 years old and still wear a one-peice bathing suit–who cares? I don’t really like people who think that they need to all of the sudden wear bikini’s and lipgloss just because of their age. Be confident in, well, whatever you do! Okay. Your a teenager. Does this mean you can still get presents on your birthday? Can you have an actual birthday party? What if you get a dorky present? Are you still allowed to use it? Yes, Yes, Yes, and yes! Birthday parties are so much fun! Its a fun time to connect with your friends, and to just let go of all your worries and celebrate. Don’t feel like you can’t have a birthday party just because your a teen. Have fun being who you are, but while still acting your age. I’m not saying that when your 12 years old you have to like a boy, but you should just do what you like to do. I think that girls who “grow up too fast” will totally regret it in life later on. Don’t let go of being a kid, sometimes – Childhood doesn’t last forever, you know. So, make it last! I’m not saying that when your 15 you have to play with a stuffed animal, I’m saying this: Don’t grow up too fast! You are beautiful. You are strong. You are wonderful. Don’t let anyone tell you your not. I really hoped you liked this article, because I really like it, too! Sorry its so short! I was thinking about doing this segment called Beauty Icons. Its mainly about celebrities with great makeup or style, and all the ways to get their look. Oh! And one more thing–My allergies cleared up! Yay! It feels like I can actually breathe again! Anyways, this weeks Beauty Icon is Lauren Conrad. Why Lauren Conrad? Isn’t she just an actress? Well, no. Did you know that Lauren, her hairstylist, and her makeup artist run a beauty website called The Beauty Department? I found that out on Wikipedia 🙂 The thing that I love about Lauren’s style (especially for beauty) is her winged eyeliner. She always looks so wonderful with her eyeliner like that! Since she has hazel eyes, black eyeliner will really make her eyes pop! I always have trouble with winged eyeliner….If only Lauren could show me how! Fortunetly, I’ve got some easy steps for acing winged eyeliner, just like Lauren’s. 1. Don’t use a pencil for the winged liner. Instead, use liquid liner! It a lot easier for getting the perfect wing. You will need pencil for one thing, though–To trace. First, you want to create the shape of the wing using your pencil liner. It will help avoid blotches when your using the liquid liner. 2. Once you’ve used the pencil to start out with, its finally time to grab that liquid liner! Use one quick, but gentle stroke and flick it up and the outer corner for the perfect wing. It’ll look almost professional! 3. In case your liner runs, the most simple thing to do it grab a tissue and blot gently. Your liner will eventually become dry, minute by minute. Don’t do a lot of running around after you’ve applied. This could just make it run even more. If you want a more girly and natural look, I’d go with the glossy light pink. This gives you more of a feminine touch, and you’ll look pretty without even trying! If your trying to go for more of a mature, sophisticated look, I’d definitely go for the deep red lipstick. It’ll stand out, proving that your totally-ready to make a move with this super-fierce look (you’ll definitely stand out in the hallway)! Well, there you have it! 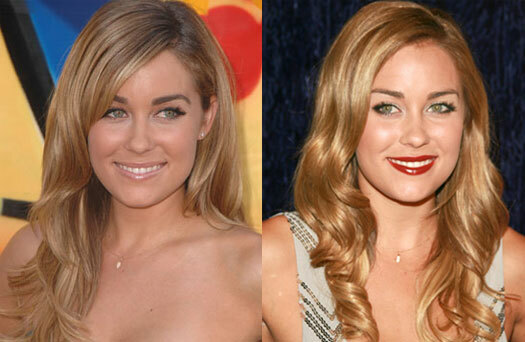 What I love about Lauren Conrad’s beauty style! If you have any ideas on a Beauty Icon you want me to write about, just comment on this post. I’d love to hear from you guys!